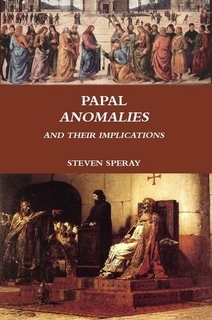 PAPAL ANOMALIES AND THEIR IMPLICATIONS is a one of kind book. There have been major anomalies in the Catholic papacy with severe implications. Never before in history has anyone dealt with all of them first hand (as far as I know). You will read how an antipope was recognized as a true pope by the whole Church for hundreds of years, and how several true popes were unlawfully elected to the Chair of Peter. What does it mean? These and many more anomalies are explained. This may be the most fascinating book you’ll ever read on the papacy. Can a pope believe contrary to the Divine laws and the Catholic faith if the Church is unaware of his intentions, or even if he (papal claimant) personally thinks that he isn’t believing and practicing contrary to the Catholic Faith? Does the pope actually have to believe in the Divine laws and Catholic Faith or does he only have to have the intention to do so while manifestly going against the Faith in the external forum? The Law doesn’t require internal knowledge or intention. To be found guilty of heresy, obstinacy only needs to be observed in the external forum, even if subjectively one isn’t actually obstinate. No one can judge hearts, not even the Church. According to the Law (both Divine and Church), the pope must in the external forum manifestly demonstrate that he knows and believes in the Catholic Church. He can’t be a dummy (ignorant), and he can’t only have an internal intention of following the Faith. According to the Law, there are no excuses for the man claiming to be pope. If he goes astray from defined truth or Divine law, he must be considered a non-Catholic and a non-member of the Church, no matter what! This is universally taught by the Church through the popes, saints, and theologians. “The very commission of any act which signifies heresy, e.g., the statement of some doctrine contrary or contradictory to a revealed and defined dogma, gives sufficient ground for juridical presumption of heretical depravity… Excusing circumstances have to be proved in the external forum, and the burden of proof is on the person whose action has given rise to the imputation of heresy. In the absence of such proof, all such excuses are presumed not to exist.” (Eric F. Mackenzie, A.M., S.T.L., J.C.L. Rev., The Delict of Heresy, Washington, D.C.: The Catholic Univ. of America, 1932, p. 35. (Cf. Canon 2200.2). Another canon law manual states: “If the delinquent making this claim be a cleric, his plea for mitigation must be dismissed, either as untrue, or else as indicating ignorance which is affected, or at least crass and supine… His ecclesiastical training in the seminary, with its moral and dogmatic theology, its ecclesiastical history, not to mention its canon law, all insure that the Church’s attitude towards heresy was imparted to him.” G. McDevitt, The Delict of Heresy, 48, CU, Canon Law Studies 77. Washington: 1932. The Faithful are not required to read the mind of a delinquent even if that person claims to be pope. The Faithful are not required to presume innocence of a cleric, especially the pope, before concluding that he is a heretic. Pope Pius VI, Auctorem fidei, Aug. 28, 1794: “47. Likewise, the proposition which teaches that it is necessary, according to the natural and divine laws, for either excommunication or for suspension, that a personal examination should precede, and that, therefore, sentences called ‘ipso facto’ have no other force than that of a serious threat without any actual effect” – false, rash, pernicious, injurious to the power of the Church, erroneous. “In addition to this, what finds itself in the ultimate disposition to death, immediately thereafter ceases to exist, without the intervention of any other external force, as is obvious; therefore, also the Pope heretic ceases to be Pope by himself, without any deposition. God is most clear in the Holy Scriptures. Gal.1: 8-9: “But even if we, or an angel from heaven, should preach to you a gospel contrary to that which we preached to you, let him be accursed (anathema). As we have said before, so now I say again, If any one is preaching to you a gospel contrary to that which you received, let him be accursed (anathema). There’s no end with him. THERE ARE NO ARGUMENTS LEFT! You must conclude that the Benedict XVI is not the pope or else you are rejecting the Law of God and the universal teaching of the Church.